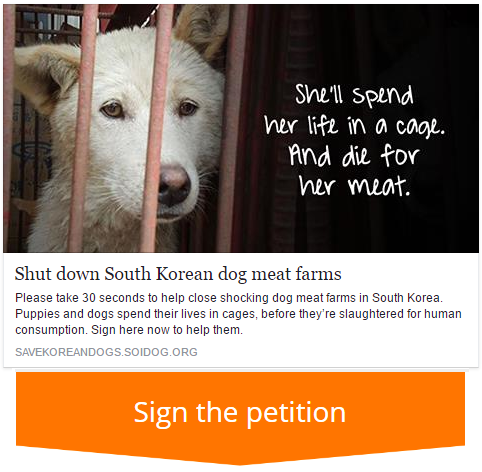 South Korea’s dog meat industry has caused controversy for years with exponents citing it as a part of Korean culture, and pointing out the apparent hypocrisy of detractors who eat other animals. As somebody who chooses not to consume meat at all do I see any difference in consuming dogs and other animals, and are there major differences between the dog meat industry and other forms of livestock? To begin with one has to accept that traditionally in times of famine man will eat anything that is available in the quest to survive, even other men. However, in the 21st century Korea is one of the world’s leading economic nations and there are no economic grounds for eating dog meat. It is universally accepted that carnivorous animals like dogs, can never be successfully farmed without resorting to cruel methods. When the first domestic dogs were bred from the wolf, they were not bred for food, but as working animals to protect homes and livestock. Many anthropologists believe that without this domestication man would still be hunter gatherers. Over the millennia because of their special relationship with man, many breeds have been developed to carry out tasks that have benefitted mankind to this day, not least being simple companionship. We bred dogs to be loyal to us. In return we have let them down. A dog is a dog, and one cannot differentiate between pet dogs and meat dogs. The reality is that in no country anywhere in the world are dogs classified as livestock. The only country in the world where they are commercially farmed is Korea, and such farms are unregulated and a stain on the image of the country. The fact is that if the entire world went vegan tomorrow, livestock animals that have been bred by man purely for their meat and other products would cease to exist except in theme parks and zoos. Dogs would continue to flourish as working animals and companions. People eat dog meat in Korea because of totally unfounded beliefs in its properties. Those who exploit dogs, will tell you that dog meat is good for you. Anybody who believes that eating dog meat is beneficial to their health is extremely foolish. Dog meat has been scientifically proven to have no special properties, and the reality is that it is actually dangerous to eat it, as dogs carry many harmful pathogens that can be passed to humans, and with dogs not being classed as livestock few if any controls exist to control quality. In addition, it is known that dog farmers use excessive antibiotics to keep the dogs alive. The heavy use of antibiotics in farm animals is leading to resistance to these drugs in humans, and Korea has a major problem with this. There is nothing in dog meat that will bring you luck, cool or warm your body or make you virile. These are myths perpetuated by those who have no conscience in inflicting cruelty on these animals to exploit gullible people. Again, one asks how in the 21st century a modern country like Korea can still practise and people believe in such traditions. The most compelling argument though is the cruelty involved. Today South Korea is one of the world’s leading nations in virtually every field, including being voted the world’s most innovative country. Yet in one area it lags far behind, and that area is animal welfare. Sadly, ask a foreigner what they associate with Korea, and more often than not the answer will be dog meat. The image of Korea internationally is being tarnished by the cruelty and inhumanity shown by a small minority of its people. Cruelty is at the very heart of the dog meat industry. From the farms to the slaughter houses cruelty is everywhere, but in the main kept hidden from the consumer. Dogs have been proven to be the only animal outside of man himself, able to read our emotions and react to them. When dogs are barbarically hung, beaten and sometimes burnt alive in front of other dogs, one can only imagine the pain, and the fear and trauma those awaiting the same fate go through. We call ourselves human beings as we believe we differ from other species in that we understand and practise humanity. Humanity involves showing kindness to all creatures. The dog meat industry demonstrates simply how inhumane as a species we really are. 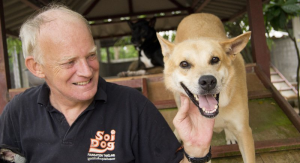 Soi Dog Foundation, as an Asian based organisation, will continue to focus on exposing the cruelty and inhumanity involved in the dog meat industry. It is clear that the vast majority of Korean people are unaware of the scale of it. We do not believe that any normal Korean would support the inhumanity exhibited in this horrific trade, and we see our role as one of education and encouraging laws to end it, as we have done in Thailand. Culture is something to be proud of. Healthy Korean food is now being exported around the world. Why not dog meat if a part of this culture? The fact that the government have driven the trade underground during major sporting events indicates clearly that they understand the industry is an embarrassment and unacceptable. Quite simply there is no place for cruelty in culture in the modern world. More and more Koreans including enlightened and progressive politicians are demanding change. Other less developed countries in the region have already banned dog meat. Korea needs to do the same and show the world it is an advanced nation in every field. Demand is falling, and the costs involved in subsidies to farmers, to switch to healthier and more environmentally friendly products, would be small in comparison to the benefits reaped.